Onward to 2018 — Happy Holidays from Philly We Rise! Happy holidays, Philly We Rise! We can’t believe 2017 is already over. For many of us, this has been a year unlike any we have ever known. Each day seems to bring a new unprecedented political moment, and a new battle to hold onto things we may have never imagined might be taken away. And in other ways, this year has simply brought more of what we’ve been faced for as long as we — and our ancestors — can remember. We didn’t start Philly We Rise after Trump’s election because we thought we had new battles that we didn’t have before. We started Philly We Rise because we wanted to lift up the organizing and voices of those that knew that Trump’s rise, though frightening, was simply one symptom of a broken system that, for centuries, has pushed down the interests of everyday people in order to lift up the wealthy and powerful. We wanted to bring a spotlight onto the leaders who know what we’re up against, so that no one newly mobilized by Trump’s rise would enter the struggle alone from square one. The calls to action we’ve heard across Philadelphia and the region this year are too many to list. We shut down the city for multiple days when the Republicans came to town for their “retreat” in January, marching on City Hall, and dancing in the streets for LGBTQ healthcare. We dropped what we were doing and came out to the airport by the thousands when Trump announced his first anti-Muslim travel ban. We went to Senator Toomey’s office every Tuesday to demand he hear from his constituents. We forced the District Attorney race to be about what matters most to Philadelphians: ending mass incarceration and a racist criminal legal system that targets Black and Brown people in our city. We organized community networks to look out for each other and helped families find safety. We took back control of our public schools. With the last-ditch passage of the #TaxScam that will hurt everyone but the super rich, with the destabilization of our healthcare system, with uncertainty for immigrants, and serious threats to free and open internet communication, there will be no rest to our struggle in 2018. The new year also brings new potential, including a new District Attorney, and the opportunity to push the governors race and midterm elections to be about issues that matter to us, the people. 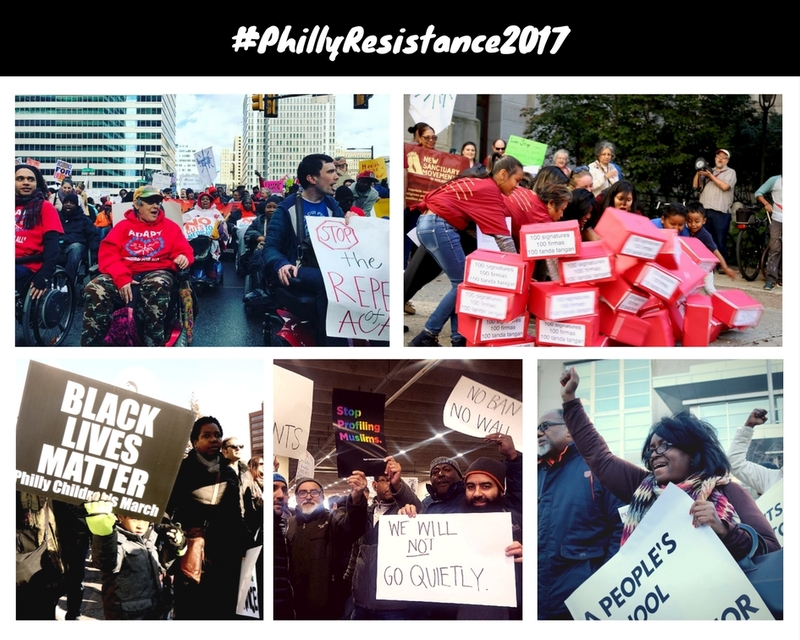 In 2018, Philly We Rise will continue to report from the ground, bringing you links, events, livestreams, video, photos, and Weekly Happenings to let you know what’s going on and what’s coming up in the #PhillyResistance. We are so grateful to be your source for progressive and people-powered organizing in Philadelphia in the age of Trump. If you’ve found value in Philly We Rise this year, please consider making a donation or buying a t-shirt or hoodie to support our work, so we can amplify and elevate the struggle in Philadelphia and the region until we’re all free. We’ll see you in 2018! Until then, we are sending you the warmest wishes on this Winter Solstice, and joy and power for the new year!